The Hells Canyon Scenic Byway has three distinct segments that showcase varied landscapes and pass through small, rural communities. A side trip takes travelers to the recreation opportunities and spectacular views along the river in the heart of the canyon. Click on the Byway segments below for detailed descriptions. This section of the byway is eighty-four miles via OR Highway 82 and county road 350; allow two hours for travel and another one to two hours for stops. Drive with care as the road may be snowy and icy in winter. Beginning in the patchwork farm lands and hillside orchards of the broad Grande Ronde Valley, the first leg of the Byway follows numerous rivers through ever-higher valleys to the glacier-carved Wallowa Mountains. Each small town along the way offers a different character and a different combination of services. Est. 1865; pop. 12,540; elev. 2,788′. Lodging, RV park, restaurants, shopping, groceries & gas. From La Grande and Island City, take OR Highway 82 east. La Grande was established at a popular rest stop along the Historic Oregon Trail. A wide variety of travel services and proximity to varied terrain make La Grande a popular recreation base for cyclists, hikers, hunters, fishermen, skiers, as well as snowmobile and ATV enthusiasts. The Mount Emily Recreation Area is directly adjacent to the city’s north end. MERA offers over 3,600 acres of trails, with some designated for mountain biking, hiking, horseback riding and other non-motorized and some designed for ATV and motorcycle use. Enjoy excellent wildlife viewing and bird watching nearby, at Ladd Marsh Wildlife Area. Exceptional fall colors highlight the upper Grande Ronde River (OR hwy 244) in autumn. Concerts, plays and art exhibits happen year-round at Eastern Oregon University. Walking tours highlight the community’s historic homes, urban forest and the downtown commercial Historic District, a Main Street community. Summer weekends are filled with annual festivals and rodeos. Signs of this region’s timber and agriculture-based economy abound. Leaving town, watch for fields of bright yellow Canola (for oil), mint, alfalfa, wheat, barley, garbanzo beans, seed potatoes and world famous turf grass seed. Est. 1922; pop. 305; elev. 2,732′. Groceries and deli; Byway interpretation site. Pastoral Imbler’s farming heritage is deeply rooted. Known as the “Grass Seed Capital of the World,” the community serves the thriving agriculture industry that surrounds it. Numerous Century Farms in the area have been operated by the same families for more than 100 years. The community and Mt. Harris, to the east, were named for early settlers. Look for the byway interpretation signs at the historic white church on the south edge of town. Est. 1891; pop. 1,635; elev. 2,670′. Lodging, RV Park, restaurants, groceries & gas; Byway interpretation sites. The former location of Fort Baker and a trading area since the 1880s, Elgin is a gateway to outstanding outdoor recreation in the Umatilla and Wallowa-Whitman National Forests. Home to cattle, grain and hay producers as well as mill and timber workers, this little community hosts the roaring Elgin Stampede PRCA Rodeo the second weekend each July. The beautifully restored Elgin Opera House presents movies, concerts and live theater. The Grande Ronde River flows through town, providing ample opportunity to raft, fish and enjoy the scenery. A scenic side trip to the north will take you to the Looking Glass Fish Hatchery. The Eagle Cap Excursion Train departs from Elgin, offering rides along the beautiful Grande Ronde and Wallowa Rivers. Call 1.800.323.7330 for information or book online at www.eaglecaptrainrides.com. Look for byway interpretation signs at Clarence Witty Park in the center of town and at the historic Elgin Opera House. Store, boat launch & state park; Byway interpretation sites nearby. The Minam and Wallowa Rivers meet here and flow into the Grande Ronde River a few miles down stream. Segments of all three rivers have earned Wild and Scenic designation. The rivers offer excellent steelhead fishing, rafting and year-round wildlife viewing. In winter, watch for bald eagles and other raptors. The nearby Minam State Recreation Area offers primitive camp sites on the scenic shores of the Wild & Scenic Wallowa River, www.oregonstateparks.org. From here, the Byway climbs through a series of valleys toward the majestic Wallowa Mountains. Notice how crops vary along the route. Use caution, you’ll be sharing the road with log trucks, horse trailers and cattle trucks. Watch for byway interpretation signs east of Minam at the rest area waysides along the Wallowa River. Est. 1899; pop 760; elev. 2,923′. Lodging, cafes, groceries & gas. “Wa-Lo-wah” shares its Nez Perce name with the mountains, lake, river and valley you’re now entering. The Wallowa Band of the Nez Perce knew the area for it’s great fishing -Wallowa is the name of the tripod used to support their fish nets. The band gathers here for TamKaLiks, an annual Friendship Feast and Pow Wow each July. Residents depend on the land for farming, ranching, logging and milling. The Byway continues along the bubbling Wallowa and Lostine Rivers. Est. 1903; pop 230; elev. 3,200′. Drive-through espresso stand & groceries. At this tiny turn-of-the century town, visit second hand stores or rest a while on a wooden bench in front of the combination sporting goods, grocery and dry goods store. Lostine comes alive during the town’s big 4th of July Flea Market. Numerous Forest Service roads in the vicinity provide access to year-round recreation in the Eagle Cap Wilderness. A side trip up the crystal clear Lostine River leads to rustic campgrounds, trailheads, and breathtaking scenery. Est. 1889; pop. 1,940; elev. 3,757′. Lodging, restaurants, shopping, groceries & gas; Byway interpretation site. The largest of the Wallowa Valley communities, Enterprise offers an array of shops, accommodations and back country and river outfitters. Hells Canyon Mule Days is a popular annual event in September. The scenic Alpine Golf Course lies just north of town and a buffalo ranch can be seen one mile north of Enterprise on Highway 3. The Wallowa Mountains tower above rolling ranch lands, providing a magnificent backdrop to the city. Stop at the byway interpretation sign west of the community before the road drops into town. Est. 1887; pop 1,130; elev. 4,191′. Lodging, restaurants, shopping, outfitters and recreation, groceries & gas. The Joseph Information Booth is open during summer. Named for young Chief Joseph of the Nez Perce Tribe, this town is now a flourishing art community with a national reputation for its top quality bronze foundries and art galleries. The summer is full of events—from art and music festivals to the Chief Joseph Days Rodeo in July. The Eagle Cap Extreme Sled Dog Race is an Iditarod qualifier that takes place in January. Most galleries and shops are open year-round, as are museums with Indian artifacts and early history collections. Use facilities at Joseph or Wallowa Lake as a base for extended Hells Canyon or Eagle Cap Wilderness exploration. Call ahead to arrange a foundry tour and reserve accommodations. Continue on Highway 82 to Wallowa Lake or proceed on the Byway route; at the north edge of Joseph, turn east (between the gas station and grocery store) onto Highway 350. Lodging, RV Park, restaurants, convenience groceries, tramway, boat launch, marina, state park & campground. No gas. Many services are open seasonally. Beautiful Wallowa Lake was shaped by glaciers which covered this region three to seven times. The 2,000 foot thick Bennett Glacier scoured the West Fork of the Wallowa River for almost 20 miles, creating Wallowa Lake and leaving nearly perfect examples of lateral and terminal moraines around the lake. Mule deer wander in the vicinity year round. At six miles in length, Wallowa Lake is a playground to water skiers, jet skiers, and paddle-boaters. Go carts and miniature golf are popular pursuits on shore. Take a tramway to spectacular views atop the 8,300 foot summit of Mt. Howard, on the edge of the Eagle Cap Wilderness. Two miles of hiking trails at the top of the tram ride provide incredible views into three states. This area was part of the ancestral homelands of the Wallowa Band of the Nez Perce. A monument to Old Chief Joseph rests at the north end of the lake. Nearby is Iwetemlaykin State Heritage Area, a new state park that offers short hikes with grand views between the north end of the lake and Joseph. This 62-acre parcel of rolling grassland, set amidst the stunning backdrop of the Wallowa Mountains, became a State Heritage Area in 2009. The entire area is part of the ancestral homeland of the Nez Perce Tribe, and is a sacred place to the Nez Perce Tribe, the Confederated Tribes of the Colville Reservation and the Confederated Tribes of the Umatilla Indian Reservation. “Iwetemlaykin” is the Nez Perce name for this area of the Wallowa Lake basin. Pronounced ee-weh-TEMM-lye-kinn, the name translates to “at the edge of the lake.” The property is adjacent to a Nez Perce National Historical Park, site of Old Chief Joseph Gravesite and Cemetery. Return to Joseph and take Road 350 east. From Joseph, travel on Highway 350 for 8 miles to the junction with Forest Road 39, also known as the “Wallowa Mountain Loop Road.” It’s decision time: take 39 south toward Halfway, or, stay on 350 for side trips to (1) Imnaha and (2) Hat Point, where the most spectacular views of Hells Canyon and the Seven Devils Mountains on the Idaho side can be seen. It’s over a mile straight down from the canyon rim at Hat Point to the banks of the Snake River below. Allow 3-4 hours for this side trip or camp overnight. The road from Imnaha to Hat Point is improved gravel and includes narrow curves and a steep climb. 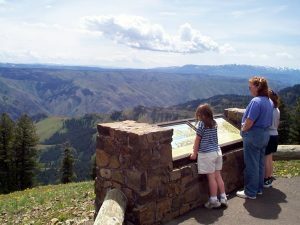 be sure to stop at the five-mile overlook for an eye-popping view of the Imnaha River canyon before crossing the plateau to look into Hells Canyon of the Snake River. Forty-five miles of paved winding road on steep side slopes, allow 1 1/2 to 2 hours. The road narrows to 1 1/2 lanes for about 11 miles along Gumboot Creek. No gas, no services; water at some Forest Service campgrounds. The FS 39 Road is open to wheeled vehicles June – October; in winter the route is groomed for snowmobile travel and Nordic skiing. For up-to-date road information and Wallowa Whitman National Forest recreation opportunities, go to www.fs.usda.gov/wallowa-whitman. The Wallowa Mountain Loop (FS Road 39) connects the northern leg of the byway, Oregon Highway 82 from La Grande to Joseph, with the southern leg of the byway, Oregon Highway 86, from Baker City to Halfway and the Hells Canyon and Brownlee dams of the Snake River. The road completes the loop that encircles the magnificent Wallowa Mountains. This segment offers exceptional views of the Wallowa Mountains and the distant Seven Devils Mountains on the Idaho side of the Snake River. It crosses several river drainages, including the Imnaha where Snake River Chinook Salmon and Bull Trout spawn. Along the way are numerous trailheads and campgrounds as well as the Canal Fire burn, where a lightning-caused fire burned 23,000 acres in 1989. In summer this is a hiking trailhead area; in winter, it’s the end of the paved road and the entrance to a snowy playground. Ahead are Lick Creek Campground and Guard Station, listed on the National Historic Register, and Ollokot Campground, a site historically used by the Nez Perce Tribe and named after Young Chief Joseph’s brother. 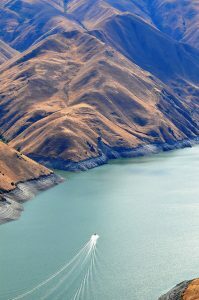 Side trips off this segment include (3) Hells Canyon Overlook, at mile post 29 for expansive views of canyon country and (4) Snake River Segment, at the junction with Highway 86, to enjoy the riverside campgrounds and the chance to fish, boat and raft the Snake River. A short two-mile paved road leads from the FS 39 Road to the Hells Canyon Overlook, where panoramic views of the canyonlands opens before you. The rugged basalt breaks drop to the river far below. A series of ridges are divided by creek drainages that feed the rushing Snake River and over time, have helped to carve the dramatic landscape that opens before you. This is a favorite photo stop along the byway. Seventy-nine miles on paved Highway 86; allow 1 1/2 hours for travel and 1-2 hours at the Oregon Trail Interpretive Center and other stops. Pastoral views and mining history are highlights of this Byway segment. Gold strikes brought the first settlers here in the late 1800s. Mines employed large numbers of people, including many Chinese laborers. Further along the route follow the Powder River up stream through rolling sagebrush-covered plateaus. Oregon Trail routes cross your path. Virtue Flat, near Baker City, is the site of a popular off-highway vehicle trail complex. Est. 1909; pop. 333; elev. 2,663′. Halfway earned its name as the midway point between the town of Pine and the gold mines of Cornucopia. Gateway to wilderness and river-based recreation in summer, Halfway is a popular winter destination for snowmobilers. A vast network of groomed trails connects hundreds of miles of scenic back country. On Martin Luther King, Jr., holiday weekend, take part in a Snow Festival. As you leave Halfway, watch for the marker for the Tim Goodall Wagon Train route of 1862 and the Visitor Information Kiosk near mile post #52. The USFS Pine District office provides additional information. Est. 1917; pop. 175; elev. 2,213′. Named in 1897 for the rich soil settlers found here, the area still supports farmers and ranchers and now hosts the fishing and boating enthusiasts who recreate on nearby Brownlee and Oxbow reservoirs. Look for the Hole-in-the-Wall Landslide, between mile posts #30 & #31. The 1984 landslide covered the road and temporarily dammed the Powder River. Flagstaff Hill, 5 miles east of I-84 on Highway 86. Stand for a moment in history. Marvel at the courage and hardships of pioneers on their 2,000 mile trek to the promised land of Oregon’s Willamette valley, still 300 miles away. The BLM-managed center offers extensive interactive exhibits and dioramas, seasonal living history performances, and interpretive/educational programs in an indoor theater. Themes include the explorers, mining and settlement history. Open daily 9 – 4 winter, 9 – 6 summer. Est. 1874; pop. 9450; elev. 3,499′. Restaurants, lodging, groceries & gas. Known early on as the “Queen City of the Mines,” Baker City sits along the Powder River between the dramatic Elkhorn Ridge of the Blue Mountains and the Wallowa Mountains. Turn-of-the century Victorian architecture dominates the commercial and residential buildings of the city’s downtown, earning it distinction as a National Historic District. Many buildings have been carefully restored, including the famous Geiser Grand Hotel. 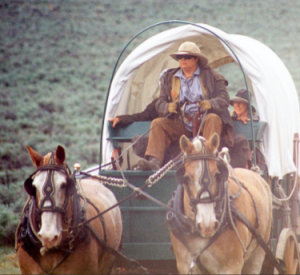 The Oregon Trail Regional Museum highlights the area’s history and houses a fantastic rocks and minerals collection. The Adler House Museum preserves the furnishings and ambience of an early businessman and community philanthropist. Follow Highway 86 from the junction of the Forest Road 39 to the Snake River and on to Hells Canyon Dam. The river is designated Wild and Scenic below the dam. You looked down into the canyon from the overlook, now see the imposing canyon walls from water’s edge up! Services at Pine, Oxbow, and at river’s edge include lodging, dining, groceries, gas, and shuttle service. Recreational opportunities include rafting, jetboat riding, camping, fishing, and hiking in the nation’s deepest river gorge. Take the winding road along the river into the heart of the canyon to the visitor center at the Hells Canyon Dam. Exhibits describe the formation of the canyon and provide information about the canyon flora and fauna. Learn about the building of the dams on the river, their use for power generation and the gold mining and farming that took place deep in the canyon early in the twentieth century. Hiking trails lead further into the canyon (please be well equipped for the rugged terrain and high temperatures) and jet boats provide exciting ventures into the Wild and Scenic designated section of the river below the dam.